The black 2200mAh Slim Power Bank from Case Logic is a portable lithium-polymer battery that allows you to charge one device with its 5V USB port. With a capacity of 2200mAh, this power bank is compatible with virtually all devices that may be charged via USB. This power bank requires a USB power outlet to recharge, and the device receives power via a micro-USB input and an included micro-USB cable. When fully drained, the 2200mAh Slim Power Bank is able to be recharged at a rate of 1000mAh per hour and also charges external USB devices at a rate of 1000mAh per hour. 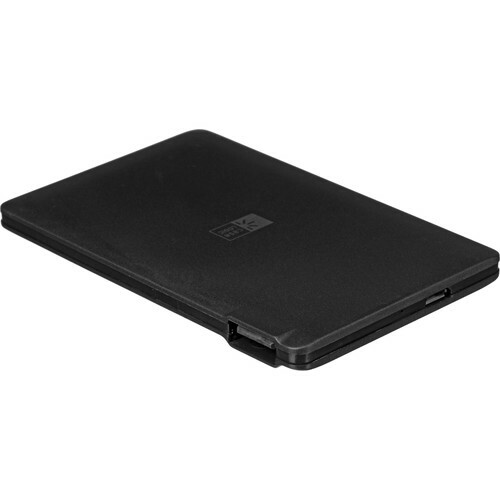 Box Dimensions (LxWxH) 6.8 x 4.4 x 1.2"
2,200mAh Slim Power Bank (Black) is rated 2.0 out of 5 by 3. Rated 3 out of 5 by Dale from Charger Compact and light. Tacked a long time to charge. Rated 1 out of 5 by Houjin from opened?used item but not indicated I thought I bought a new power bank but it is not. It is old and has been used? Rated 2 out of 5 by David from Not the correct part I bought the AirLine wireless system. With that I also bought the power bank, which is very poorly made. The cable, that came with it, does not fit the transmitter or the receiver as an accessory. What's the point of buying a support part that does not fit. It also gets hot when I charge it. Hey There, I also noticed that Case logic battery unit never seemed to turn off while charging. However after an overnight charging session, the unit's red light was off the next morning. The battery unit functioned normally without issue.